It was a victory the Yeat’s men fully deserved and there was no excuses coming from anyone in the Galway management camp after their team was outscored by 2-9 to 0-6 in the second half. At half time Alan Mulholland’s men led by 0-9 to 0-5, but even at that stage many Galway supporters in the stand were a tad apprehensive. Their side had played with the wind at their backs and yet they had only managed a meagre 0-2 from play, had shot a few poor wides, and did not force Sligo custodian Philip Greene into a single save. Some of the option taking was poor and, if there was greater vision and speed of thought up front, Galway could have been further ahead. Galway’s over-dependence on scores from play was worrying, as was the fact that Adrian Marren and David Kelly were already looking in command in their individual jousts with Finian Hanley and Keith Kelly. Any time quick ball was worked into that area of the pitch, it was the Sligo men who were dictating matters. Their defence was cool in possession and Kevin Walsh’s tactic of working the ball out by short passing was working a treat. As a result a four-point lead at the small whistle for Mulholland’s men did not insulate their followers from fearing that there was more in Sligo and, with the wind behind them, Kelly and Marren would be hard stopped. Unfortunately after half time it was Sligo who came out hungrier for possession, and they were the more aggressive outfit. They started winning many of the key individual battles and guys like Charlie Harrison, who was immense in the first half, Pat Hughes, Paul McGovern, Brendan Egan, and substitute Tony Taylor really came to the fore when picking up breaks and driving forward. Galway were genuinely struggling in several positions at that juncture. Midfield probably should have been freshened up and the danger light was flashing bright red at the space being left in front of Marren and Kelly. Eventually Sligo got the break they needed and deserved. Marauding wing-back Paul McGovern powered into the Galway sqaure to collect a ball and Galway captain Finian Hanley dragged him down for a penalty. A quick yellow card for Hanley from Maurice Deegan was followed by man-of-the-match Marren slotting home the first of his two goals. Even at 1-10 to 0-10, the momentum seemed to have swung strongly Sligo’s way and they were controlling the tempo of the game. However to Galway’s credit they rallied, and points from Gary Sice, Paul Conroy and Hehir from another free kept them in touch. Then, however, another hammer blow hit the maroon men, and there was no way back. Colin Forde, who had replaced the injured Finian Hanley, was caught out by a sublime ball by Mayo native Alan Costello into the Adrian Marren and the Sligo marksman made no mistake by firing into Adrian Faherty’s goal. 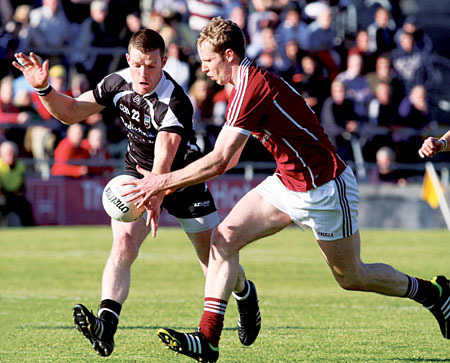 Despite all the pre-match predictions, and odds of 5/1 on Sligo, it was Kevin Walsh’s team that would be in the 2012 Connacht final and not Galway. Speaking to Sligo selector Paul Taylor after the game, it was obvious he and his squad felt they had unfinished business from 2010. The Galway players and management now need to pick themselves up over the next few weeks, dust themselves down, and try to go on a “mini-run” in the qualifiers. They will be in the round two draw and will be in action on Saturday July 14. As an extremely disappointed Alan Mulholland says it will take some time to recover.